ARxIUM greatly values precision, reliability and efficiency, as evidenced by our line of automatic vial filling machines – designed for both community and outpatient pharmacies. We boast a high production rate and script volume throughout the filling process with our vial filling machines for those in the Pharma industry. You will find information about each of our models below. Looking for a simple, reliable and compact oral solids filling machine that can be expandable to up to 5 devices? The FastFill™ 54 is a semi-automated dispensing device designed to fit your lower-volume needs. The 54 system is designed for efficiency and adaptability, allowing for flexible layout options to assist small or large pharmacies alike. The FastFill 54 optimizes barcode verification, direct-fill and a locking canister system to truly set the standard for safety. 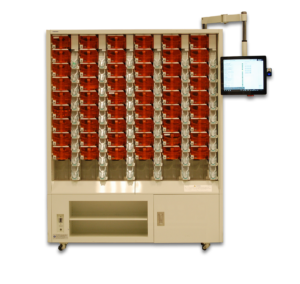 Our FastFill™ 220 high-volume model uses calibrated canisters to optimize direct-fill technology, filling 500 to 1,000+ prescriptions per day. The 220 system dispenses at a high rate of production and is designed to control the risk of cross-contamination. In line with our value of precision, this solution utilizes barcode scanning for the replenishment process and pharmacist order checking. Are you interested in pricing information for any of our vial filling machines? Contact ARxIUM today to improve your pharmacy automation and fulfillment capabilities!